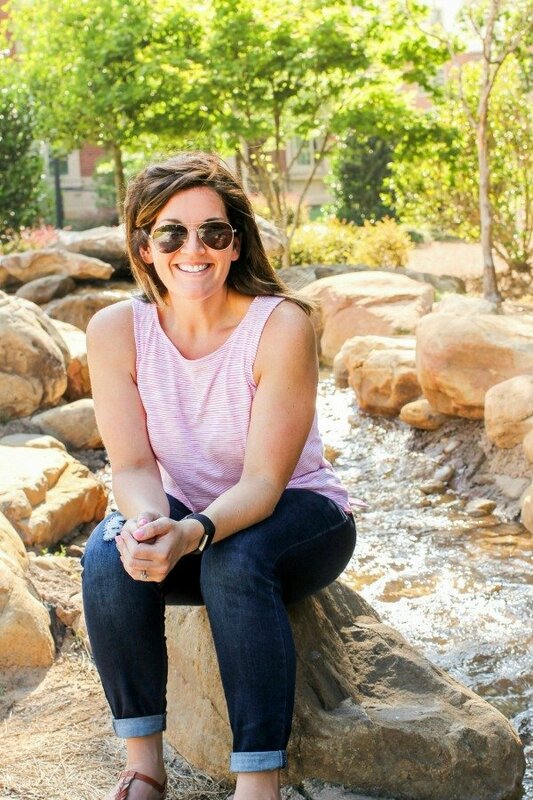 August 11, 2016 By Allyson 4 Comments This post may contain affiliate links. Read my disclosure policy. 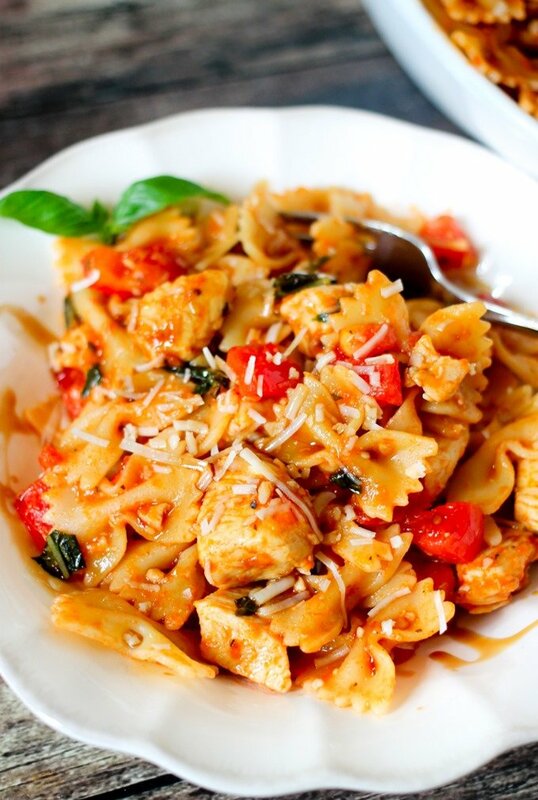 Bruschetta chicken pasta is loaded with fresh tomatoes, basil, and juicy chicken. 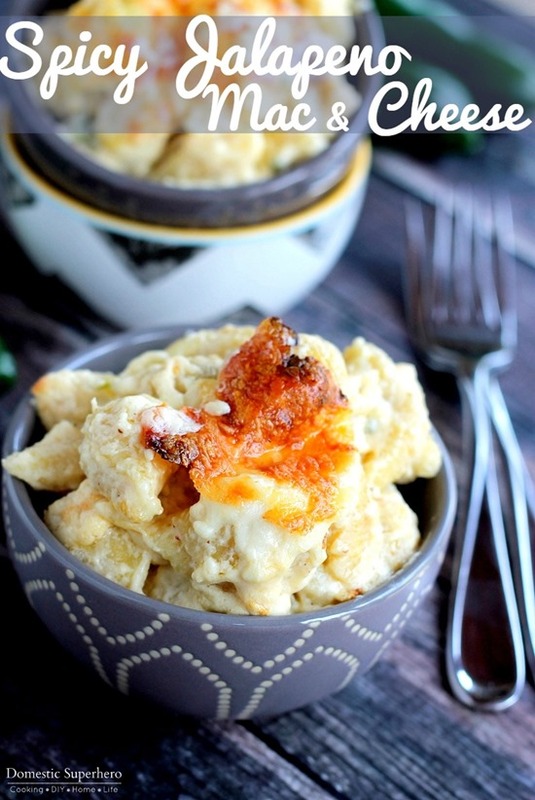 Adding a secret ingredient at the end, takes this dish to the next level! Ladies and gentleman, I have a recipe for you today that is SO good, you seriously need to run out and buy the ingredients right now, and make it for dinner. 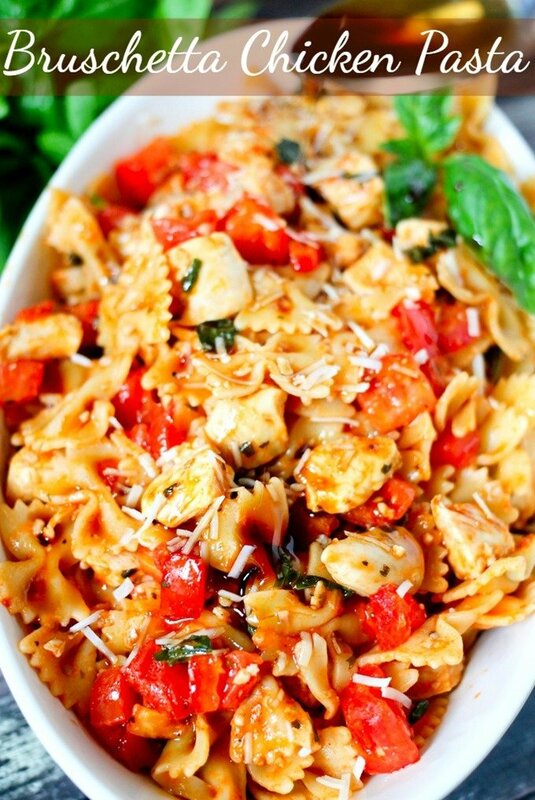 This Bruschetta Chicken Pasta is super easy to make and extremely delicious. With only a handful of ingredients, it comes together in no time. It’s also super yummy even if you omit the chicken for a vegetarian version. Don’t forget the fresh Romano cheese on top, it definitely gives it a nice finish! 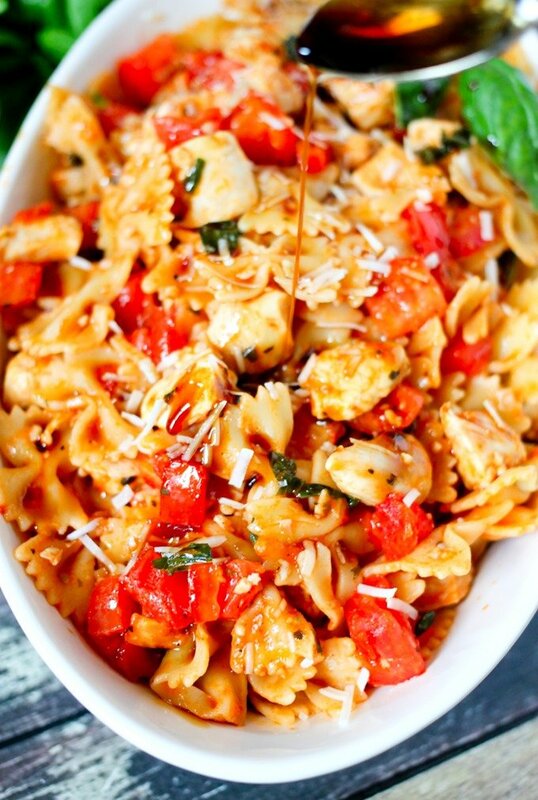 Like I mentioned above, there is a secret ingredient in this bruschetta chicken pasta, that you would never think of….balsamic vinegar glaze. You HAVE to try this to see how good it is. 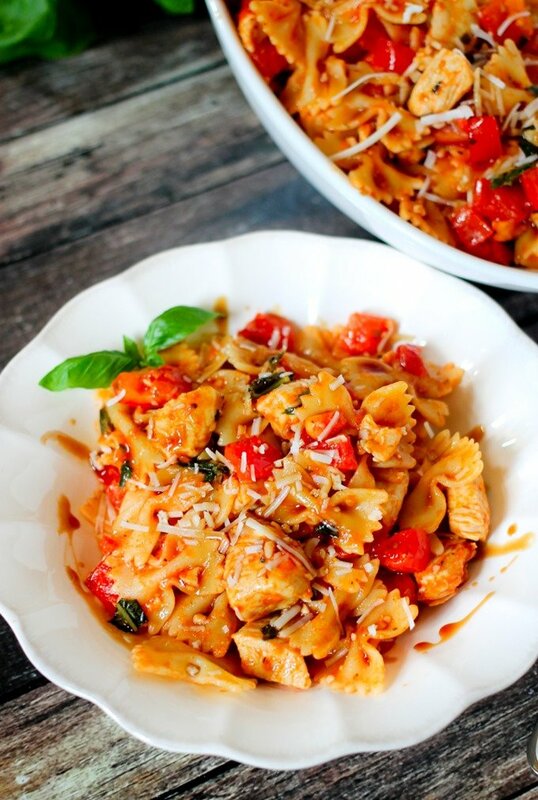 Now, when you think of bruschetta, you think of balsamic, but you never think of it on PASTA…right?!?! It might sound a little funky, but trust me, it elevated this dish to the next level, and it’s so worth adding. Don’t leave this last step out or you will be sorry! If you want a meat-free version of this recipe, even better! Leave the chicken out completely and make as is…or add some more veggies. 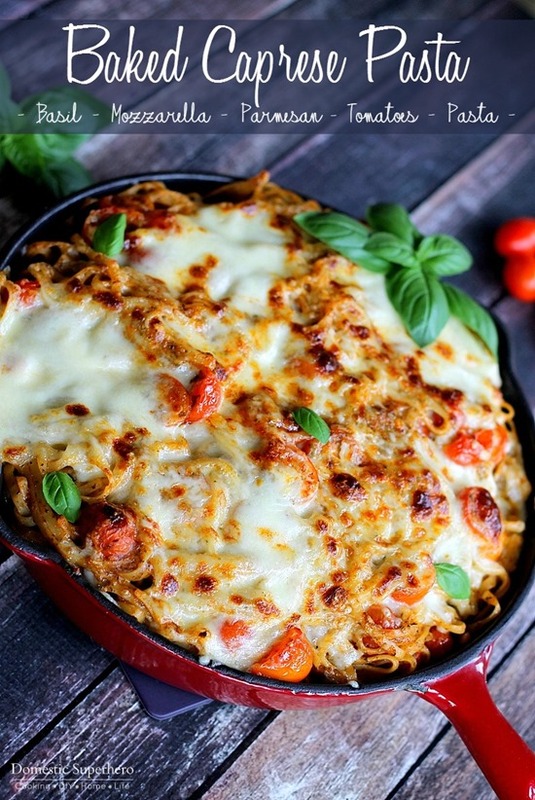 Seriously anything would be delicious in this pasta! I do recommend using fresh basil in this recipe, however if you are really in a pinch you can used dried. 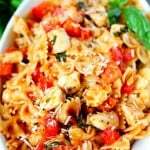 Bruschetta Chicken pasta only takes about 20 minutes to make, which is a total weeknight win in my book! Great for those nights when you almost order take-out, but decide that you can actually just make something really quickly! 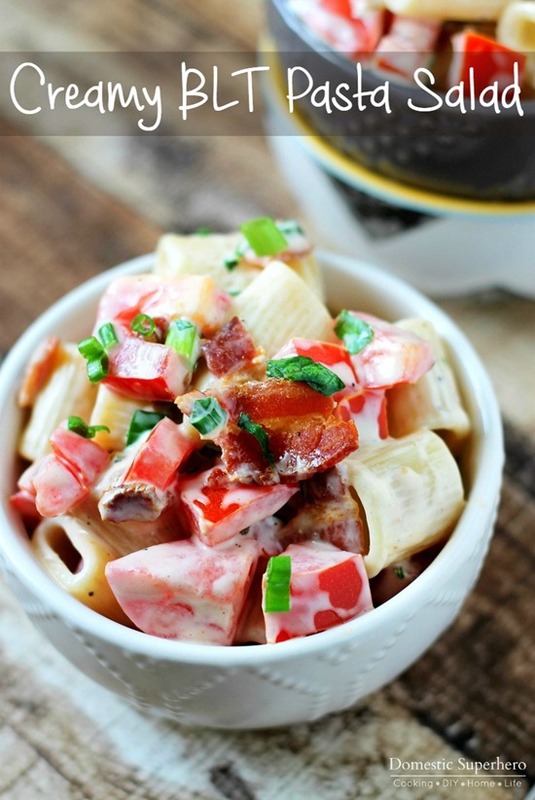 If you make this for guests, they will be majorly impressed! I can’t wait to make this on my live Facebook cooking show – hopefully in the next week or 2 I will be sharing it with you! Cook bowtie pasta according to package directions, making sure not to overcook; set aside. In a bowl, add tomatoes, basil, olive oil, salt, pepper, and 1/2 TBS minced garlic. Spray skillet with nonstick spray, add chicken to skillet and sauté until cooked through, about 7-8 minutes. Remove from plate, set aside, wipe skillet out. Add tomato mixture to skillet and sauté for 1 minutes. Add tomato sauce, and bring to a boil. sauté for 4-5 minutes. Add chicken and pasta and toss to coat; set aside. For the glaze: Add balsamic vinegar and sugar to a small sauce pot and whisk to combine. Bring to a boil, and boil for 3-4 minutes whisking occasionally, and being careful not to burn. Simmer for 2 minutes, then remove from heat. ** Drizzle over pasta and toss to coat. Add romano cheese. Serve pasta and garnish with additional basil if desired. ** You can make the glaze while you are cooking the tomato mixture, that way they will finish around the same time. 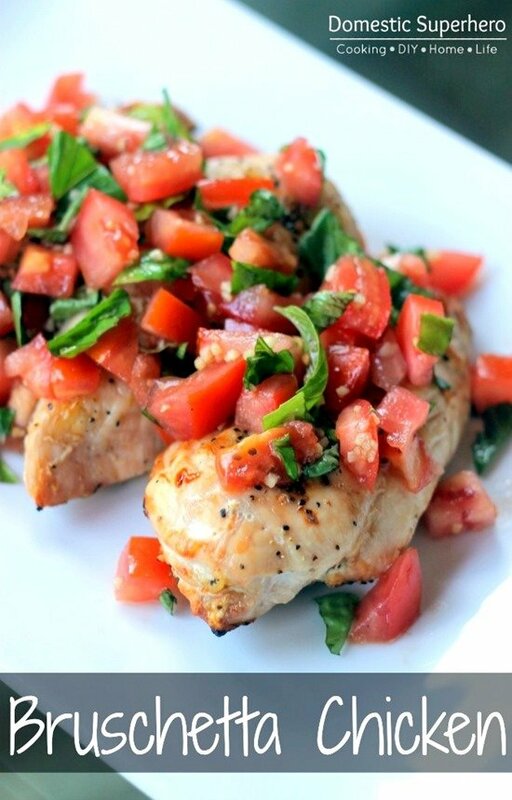 I was inspired by one of the most popular recipes on my blog, Skinny Bruschetta Chicken, for this recipe, however I recently saw this in pasta form on DietHood and was inspired to try it for myself!